On Monday, Third Congressional District candidate John Curtis reminded us why we need the United Utah Party. Curtis posted a Facebook ad calling on Congress to build a wall on the Mexican border. After he got many comments criticizing his ad, Curtis pulled it down and blamed Twitter's format. "the moderator must remain nonpartisan throughout the debates"
We are pleased that Jim Bennett crossed the threshold of the Utah Debate Commission. We expect he will be the first of many of our candidates entering those debates and articulating centrist views directed at the majority of Utah voters. United Utah Party candidate Jim Bennett has just managed to do what no third-party candidate has ever done before—secure a podium on a stage sponsored by the Utah Debate Commission. 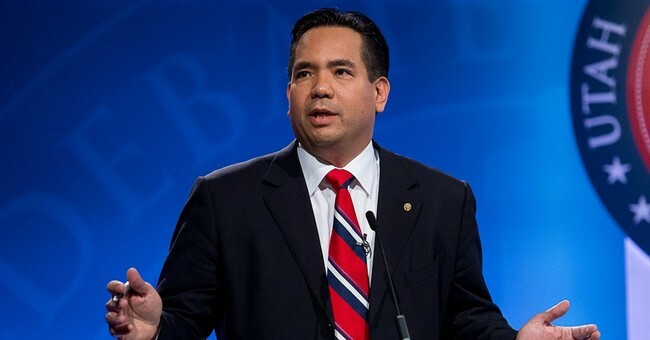 A year ago, when Republican Sean Reyes was running to for reelection as Utah’s Attorney General, he was asked a question about who his most important legal client would really be. Would it be the governor, the legislature, or the people? Now we have Reyes’ real answer: None of the above. Endorsing the right of Utahns to possess firearms, as well as regulations that limit firearm possession in the hands of those who would use them irresponsibly. In today's Deseret News, Lisa Riley Roche wonders whether Jim Bennett will be the first ever 3rd party candidate to make the cut for a Utah Debate Commission debate. Dream Team or Pipe Dream? The dangerously dysfunctional presidency of Donald Trump has endowed the nation with a Divider in Chief. Many of the Trump supporters in Utah liked the way he was willing to pick a fight. The trouble with fight-picking, though, is that our government is set up to require cooperation and compromise. The founders deliberately built a governing machinery that grinds when it gets too hot. It has to cool down to get moving again. At the moment, there are at least two hopeful signs that lubrication may be coming.